All series are equipped with Delco-Remy 6- volt storage batteries. Series 1,.0-50 use 1950 Buick battery number 15E, which has 15 plates and a capacity of 100 ampere hours at 20 hour rate. Series 70 uses battery number 17E, which has 17 plates and a capacity of 120 ampere hours at 20 hour rate. The 1950 Buick battery is located under the hood on the right side where it is fully protected, accessible, and close to cranking motor and engine so that short cables may be used. The 1950 Buick battery is mounted on a base bolted to the frame right side rail and is securely anchored to the base by two long clamp bolts and a hold down strap. The clamp bolts have wing nuts and plain washers which bear against rubber grommets seated in the bolt holes in the hold down strap. The 1950 Buick battery negative (-) post is grounded by a braided copper ground strap bolted to the engine mounting bracket. 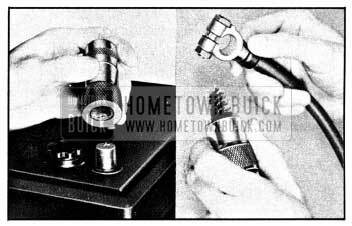 The 1950 Buick battery positive ( +) post is connected by an insulated copper cable to the 1950 Buick battery (right hand) terminal on the cranking motor solenoid switch. The cable terminals at the battery and switch are covered with rubber boots to protect against any short-circuiting. Delco-Remy Battery dealers and distributors are prepared to carry out terms of the manufacturer’s warranty on Delco-Remy batteries. In order that Buick owners shall have the protection and benefit of this warranty, it is necessary for the dealer or car owner to register his battery with the local Delco-Remy Battery dealer or distributor on all new car deliveries, and on all deliveries of new replacement Delco-Remy batteries. Batteries in stored new cars, as well as batteries in stock, must be given regular attention to prevent sulphation of plates that may result from inactivity and self-discharge. All automotive wet batteries will slowly discharge on standing idle, whether in stored vehicles or in stock, and will self-discharge much faster when warm than when cold. See figure 10-1. Batteries in stock should be rotated and the older ones used first. To minimize the extent of self-discharge always store batteries in the coolest possible place, but avoid freezing temperatures. At frequent intervals check the level of electrolyte and add water as required; also check the specific gravity with a hydrometer (par. 10-19). A boosting charge at a moderate rate (par. 10-22), without excessive overcharge, must be given batteries in storage whenever the specific gravity falls to 1.250, corrected for temperature. Batteries used for display purposes or standing in cars in storage must be treated in the same manner as batteries in stock. When a new car, or a new replacement battery is delivered, make certain that it is fully charged and the electrolyte is at proper level. This is extremely important because the delivery of a partially discharged battery may not only lead to its return for charging but may also result in shortened life of 1950 Buick battery. 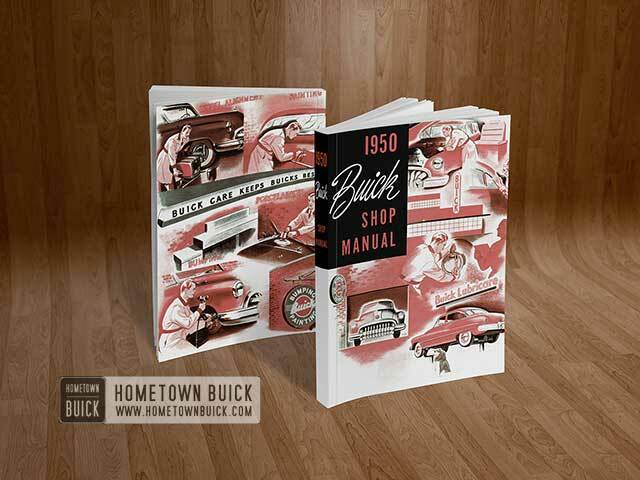 The 1950 Buick battery has three major functions: (1) It provides a source of energy for cranking the engine. (2) It acts as a stabilizer to the voltage in the electrical system. (3) It can for a limited time furnish energy when the demands of the electrical units in operation exceed the output of the generator. In order for the 1950 Buick battery to continue to function, it is necessary that current withdrawal from the battery be balanced by current input from the generator so that the battery is maintained in a properly charged condition. If the outgo exceeds the input the battery will become discharged so that it cannot supply sufficient energy. The proper functioning of the generator and regulator, therefore, has an important bearing on the proper functioning of the battery. The state of charge of the 1950 Buick battery as well as the temperature of the electrolyte has an important bearing on its capacity for supplying energy. 1950 Buick battery efficiency is greatly reduced by decreased electrolyte temperature as it has a decided numbing effect on its electrochemical action. Under high discharge such as cranking, battery voltage drops to lower values in cold temperatures than in warm temperatures. 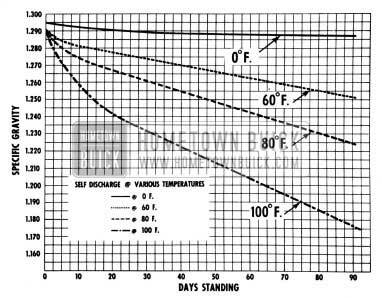 The following comparison shows how states of charge at temperatures of goo, 32°, and 0° F. affect efficiency and cranking power, with efficiency in the fully charged state at goo F. equal to 100 %. In extremely cold climates it is important to keep batteries in a nearly full charged condition to avoid the possibility of freezing, which will damage any 1950 Buick battery. Figure 10-2 shows the temperatures at which freezing will occur in electrolytes of different densities, with specific gravity corrected to 80° F. Note that at 1.180 (nearly discharged) the electrolyte will freeze at approximately 5° below zero. The 1950 Buick battery requires very little attention, but periodic inspection is essential to secure the maximum efficiency and life. The following services are essential to maintain the battery at maximum efficiency. CAUTION: The gas which is produced in the 1950 Buick battery cells during charging is dangerously explosive. Extreme care must be taken to avoid bringing open flames, lighted matches, etc., near a battery which is or has been recently on charge, and which is or has been gassing. Likewise care must be taken to avoid causing any sparks near a battery, since this can also set off an explosion of the gases. Before making contact with 1950 Buick battery it is advisable to establish metallic contact between car bumper and ground to discharge any static charge in the car. Electrolyte Level. One of the most important of all battery services is the periodic addition of pure water to maintain the proper level of electrolyte in each cell. See paragraph 10-18. 1950 Buick Battery Hold Down Bolts and Strap. Check hold down bolts occasionally to make certain the battery is held securely to battery base on the frame. The wing nuts should be drawn up finger tight; tightening wing nuts with pliers or wrench may distort the battery case. If the top of 1950 Buick battery is dirty or the hold down strap is corroded, clean thoroughly with a brush dipped in ammonia or soda solution. Tighten vent plugs to prevent any solution from getting into 1950 Buick battery cells. After the foaming of solution stops, flush off with clean water and dry thoroughly. If hold down strap is corroded it should be painted with acid-resisting paint after cleaning. 1950 Buick Battery Cables. Check 1950 Buick battery cables occasionally to make certain they are tight at battery posts, engine mounting bracket, and cranking motor solenoid switch. If a connection is found loose it should be cleaned before being tightened as arcing and corrosion may have taken place in the loose connection. Check condition of cables and replace if badly corroded or frayed. See paragraph 10-21 for instructions on cleaning and tightening cable terminals and replacement of cables. Hydrometer Test. It is advisable to occasionally check the condition of battery electrolyte with a hydrometer (par. 10-19) in order to determine whether the generating system is maintaining the battery in a proper state of charge. This is particularly important during cold weather. High Discharge Tests. It is advisable to occasionally check the internal condition of battery and the battery cables by means of the high discharge test described in paragraph 10-20. This test will indicate whether the battery requires additional servicing, and whether the cables are setting up resistance to the free flow of current. Maintain the electrolyte at the proper level in each cell by adding pure water as required. 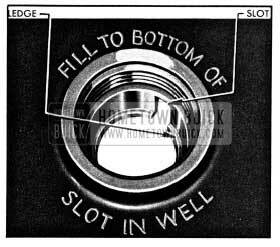 Fill to ledge at bottom of slot in well on batteries having filler well shown in figure 10-3. On batteries which do not have this type filler well, fill to 1/4″ above the separators, unless the 1950 Buick battery is marked with other instructions. Do not overfill, as electrolyte may be sprayed out by gassing during charging. After filling, see that gaskets are in place when filler plugs are installed and tightened. In freezing weather the water should be added just before using the car or otherwise charging the 1950 Buick battery so that the water will be mixed with the acid before it is allowed to stand in freezing temperatures. If it is found necessary to add water to the 1950 Buick battery more frequently than about every 1,000 miles and the quantity of water added per cell is great, check setting of voltage regulator and adjust, if necessary (par. 10-29). Abnormal water loss is an indication that the battery is being overcharged. Water is the only component of the 1950 Buick battery which is lost as the result of charging and discharging, and it must be replaced before the electrolyte level falls to the tops of the separators. If the water is not replaced and the plates and separators become exposed, the acid will reach a dangerously high concentration that will char and disintegrate the wood separators and may permanently sulphate and impair the performance of the plates. Plates cannot take full part in the 1950 Buick battery action unless they are completely covered by the electrolyte. Separators are no longer porous in the area that has once dried out as a result of exposure, therefore the corresponding area of adjoining plates is rendered inactive and subject to continuous sulphation. water is better than no water at all; however, such water should be used in emergency only. 1950 Buick battery water should be kept in a covered glass, earthenware or hard rubber container; never use a metallic container. The hydrometer measures the percentage of sulphuric acid in the 1950 Buick battery electrolyte in terms of specific gravity. As a 1950 Buick battery drops from a charged to a discharged condition, the acid leaves the solution and enters the plates, causing a decrease in specific gravity of electrolyte. By measuring specific gravity of the electrolyte with a hydrometer, an indication of the approximate state of charge of the 1950 Buick battery is obtained. The specific gravity of the electrolyte varies not only with the percentage of acid in the liquid, it also varies with temperature. As temperature increases, the electrolyte expands so that the specific gravity is reduced. As temperature drops, the electrolyte contracts so that the specific gravity increases. 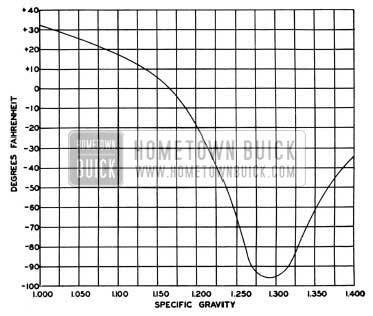 Unless these variations in specific gravity are taken into account, the specific gravity obtained by the hydrometer may not give a true indication of the state of charge of 1950 Buick battery. 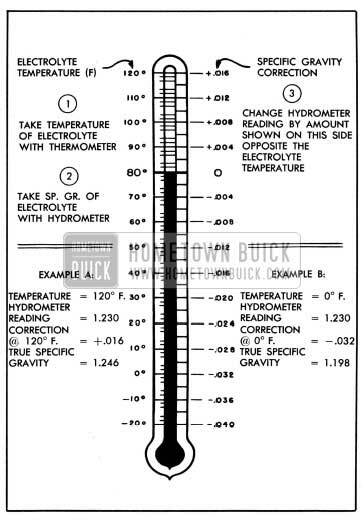 Correction can be made for temperature by adding .004, usually referred to as 4 “points of gravity,” to the hydrometer reading for every 10° F. that the electrolyte is above goo F. or subtracting .004 for every 10° F. that electrolyte is below goo F. Figure 10-4 shows the exact correction figure to use for any temperature above or below goo F., the three steps used in obtaining the corrected or true specific gravity, and two examples showing how it is figured. If the electrolyte temperature is not too far from the goo F. standard, or if only an approximate idea of specific gravity reading is required, it will not be necessary to make the temperature correction. Hydrometers are available which have a built-in thermometer and temperature correction scale similar to figure 10-4. This type of hydrometer simplifies the operation of obtaining a true specific gravity reading. Hydrometer must be clean, inside and out, to insure an accurate reading. Hydrometer readings must never be taken immediately after water has been added. The water must be thoroughly mixed with the electrolyte by charging for at least 30 minutes before hydrometer values are reliable. If hydrometer has built-in thermometer, draw liquid into it several times to insure correct temperature before taking a reading. Hold hydrometer vertically and draw in just enough liquid from 1950 Buick battery cell so that float is free floating, and with bulb fully released. Hold hydrometer at eye level so that float is vertical and free of outer tube, then take reading at surface of liquid. Disregard the curvature where the liquid rises against float stem due to surface tension. Avoid dropping liquid on car or clothing as it is extremely corrosive. Any liquid that drops should be washed off immediately with soda solution. The specific gravity of a charged battery should not vary more than 25 points (.025) between cells. A greater variation could be due to the low cell being shorted, to loss of electrolyte, or to the fact that the 1950 Buick battery is old. Such battery should be removed for a slow charge and further tests. The hydrometer test (par. 10-19) reports only the chemical condition of the 1950 Buick battery. A high discharge test with a voltmeter gives additional information on the condition of 1950 Buick battery and its ability to deliver current under load. If the battery specific gravity is above 1.250 the high discharge test may be made. If specific gravity is below 1.250 the high discharge test should not be made, since the 1950 Buick battery will not maintain a very good voltage reading under discharge if it is more than half discharged. CAUTION: Gas formed in 1950 Buick battery during charge is dangerously explosive. Sparks produced by test equipment may set off an explosion if gas remains in top of battery cells. If 1950 Buick battery has been gassing recently, remove filler plugs, blow the gas out of cells and away from area, and install filler plugs before performing high discharge tests. 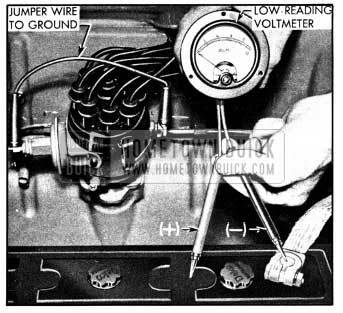 A high discharge test of 1950 Buick battery may be made with equipment comprising a voltmeter (5 volts minimum), ammeter of 300 or more amperes capacity, and a carbon-pile rheostat having a minimum capacity of 300 amperes connected in series with the ammeter. This test may be made with battery either installed or removed, and without cranking the engine. Adjust rheostat to provide maximum resistance (OFF position). Connect ammeter positive (+) lead to battery positive (+) post, and negative (-) lead to one side of rheostat. Connect other side of rheostat to battery negative (-) post. In the instrument shown in figure 10-5 the ammeter and rheostat are connected in series inside the case. If 1950 Buick battery is installed, connect ammeter and rheostat leads to battery cable terminals so that 1950 Buick battery posts are not covered. Attach prods to voltmeter leads using care to obtain clean metal contact between prods and clips on leads. Apply prod of positive (+) lead to center of positive battery post and apply prod of negative (-) lead to center of negative (-) battery post. CAUTION: Do not apply voltmeter leads to cable terminals as any resistance in the connection between terminals and 1950 Buick battery posts will affect the test readings. Adjust rheostat until ammeter reads 300 amperes, wait 15 seconds and read voltmeter, then return rheostat to starting position to avoid excessive drain on 1950 Buick battery. Voltmeter will read 4 or more volts if 1950 Buick battery discharge capacity is satisfactory. 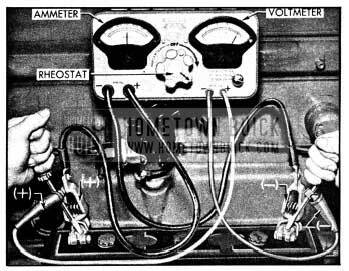 If voltmeter reads less than 4 volts, the 1950 Buick battery must be completely recharged and tested again. If equipment specified above is not available, the 1950 Buick battery may be given a high discharge test by using a low-reading voltmeter while cranking the engine. The voltmeter leads must be provided with long sharp prods so they can be pressed through sealing compound to contact the cell terminal posts. When making this test the engine must be at normal operating temperature to insure normal cranking load. Ground the primary terminal of distributor with a jumper wire so that engine can be cranked without firing. Connect voltmeter leads to the terminals of each battery cell in turn and quickly note the voltmeter reading while cranking the engine. See figure 10-6. Do not operate cranking motor more than thirty seconds at any time without pausing for a few minutes to allow it to cool; otherwise, cranking motor may be severely damaged. Remove jumper wire from distributor as soon as test is finished. If the voltage of any cell falls below 1 1/2 volts, or if there is a difference of more than 2/10 volt between cells, the 1950 Buick battery should be removed and fully recharged, then give another high discharge test to determine whether replacement is necessary. Whenever the 1950 Buick battery is tested (par. 10-20) the 1950 Buick battery cables should also be inspected for condition and tested for resistance. Resistance in the 1950 Buick battery cables and connections causes voltage drop, and excessive voltage drop is liable to cause starting difficulties. Inspect 1950 Buick battery cables for broken insulation, corroded or broken strands, or looseness in terminals. Repair broken insulation with loom or tape; however, if cable strands are broken, corroded, or loose in terminals the cable should be replaced with a genuine Buick cable to insure ample capacity. Check terminals at both ends for tight connections. Since loose connections are usually dirty or corroded, any loose connections should be thoroughly cleaned before being tightened. If terminals are tight and cables are apparently in good condition, it is advisable to test them with a low-reading voltmeter to detect any abnormal internal resistance. 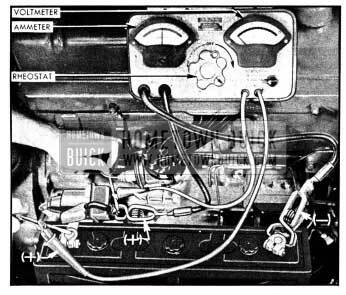 1950 Buick battery cables and terminal connections may be tested with equipment comprising a voltmeter (5 volts minimum), ammeter of 300 or more ampe1.cs capacity, and carbon-pile rheostat having a minimum capacity of 300 amperes connected in series with the ammeter. This method is preferred to use of voltmeter only (subpar. c below) because the desired load is obtained without cranking the engine. Adjust rheostat to provide maximum resistance (“OFF” position). Connect ammeter positive ( +) lead to battery terminal stud on cranking motor solenoid switch. Connect ammeter negative (-) lead to one side of rheostat and connect other side of rheostat to ground on engine, preferably at point where 1950 Buick battery ground strap is attached. In the instrument shown in figure 10-7 the ammeter and rheostat are connected in series inside the case. Connect voltmeter negative (-) lead to 1950 Buick battery terminal stud on solenoid switch. Use a prod with voltmeter lead, if necessary, to insure direct contact with the terminal stud. Do not connect to the ammeter lead clip. Attach a prod to voltmeter positive (+) lead and apply the prod to center of battery positive (+) post (fig. 10-7). Make sure that clips of voltmeter leads have clean metal contact with prods. Adjust rheostat until ammeter reads 300 amperes, immediately read voltmeter, then turn rheostat to starting (“OFF”) position to avoid excessive drain on 1950 Buick battery. Voltage drop across battery positive cable and terminal connections should not exceed 1/10 volt. Connect voltmeter positive (+) lead to ground on engine. Attach prod to voltmeter negative (-) lead and apply prod to center of battery negative (-) post. Voltage drop across the 1950 Buick battery ground cable and terminal connections should not exceed 1/10 volt at 300 amps. A reading in excess of 1/10 volt when testing either batte1y cable indicates excessive resistance in cable or connections. Clean and tighten cable terminals (subpar. d, below) and recheck for voltage drop. If voltage drop still exceeds 1/10 volt replace cable with a genuine Buick cable to insure ample capacity. If equipment is not available for testing cables and connections as described above, a test may be made with a low-reading voltmeter while cranking the engine. Connect negative (-) lead of voltmeter to the 1950 Buick battery terminal stud on cranking motor solenoid switch. Attach a prod to positive (+) lead of voltmeter and apply the prod to center of battery positive (+) post. See figure 10-8. Turn ignition switch on and crank the engine for just a few seconds while quickly noting voltmeter reading. 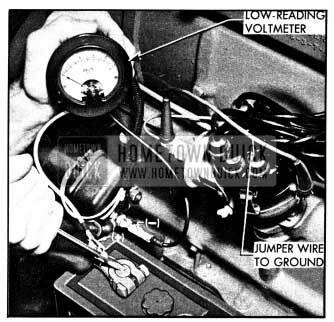 The voltage drop across the 1950 Buick battery positive cable and terminal connections should not exceed 1/10 volt. Connect voltmeter positive lead to ground on engine. Attach prod to voltmeter negative lead and apply the prod to center of 1950 Buick battery negative (-) post. The voltage drop across the battery ground cable and terminal connections while cranking engine should not exceed 1/10 volt. Remove jumper wire from distributor and turn ignition off as soon as test is finished. A reading in excess of 1/10 volt when testing either battery cable indicates excessive resistance in cable or connections. Clean and tighten cable terminals (subpar. d, below) and recheck for voltage drop. If voltage drop still exceeds 1/10 volt replace cable with a genuine Buick cable to insure ample capacity. If loose connections are found by inspection, or high resistance is found by voltage test, disconnect the cable for thorough cleaning of terminals. When removing a corroded cable terminal from 1950 Buick battery post do not pry against 1950 Buick battery case or hammer on terminal to break it loose, since either practice will result in broken cell covers. Use a screw type terminal puller if terminal cannot be loosened by hand after clamp bolt is fully loosened. See figure 10-9. CAUTION: It is advisable to always disconnect the ground cable from 1950 Buick battery first, and connect it to 1950 Buick battery last, to avoid the possibility of shorting to ground with the wrench while working on the less accessible connections of the positive cable. A wrench shorting to ground from either end of positive cable would carry high amperage and heat quickly, causing serious burns on the hand. Thoroughly clean all corrosion from disconnected 1950 Buick battery cable terminals and terminal posts, using suitable wire brushes (fig. 10-10) ; do not scrape the protective lead coating from terminals. If wire brushes are not available, corroded terminals may be cleaned by brushing with a strong soda solution, using care not to get solution into battery cells. Make sure that all other instruments are off. Connect one cable (preferably positive) to 1950 Buick battery. Before connecting the last cable to 1950 Buick battery, press the terminal to its post on battery. Immediately afterward strike the terminal against 1950 Buick battery post to see if there is a spark. If there is, allow the clock to run down until it stops ticking, and repeat as above until there is no spark. Then immediately make the permanent connection before the clock can again run down. The clock will run down in approximately 2 minutes. Reset clock after all connections are made. NOTE: The above procedure should also be followed when reconnecting the clock after it has been disconnected, or if it has stopped because of a blown fuse. Be sure to disconnect 1950 Buick battery cable before installing a new fuse. To prevent corrosion of 1950 Buick battery terminals and connections, apply a coating of petroleum jelly over the 1950 Buick battery post and cable terminals. CAUTION: Animal or vegetable greases will cause rapid corrosion of terminals. 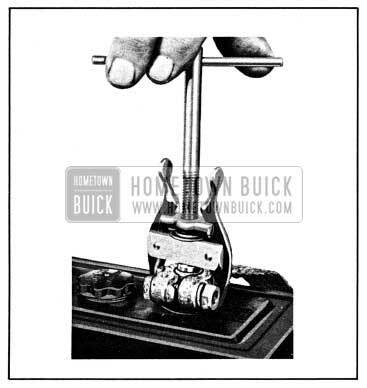 Make sure that rubber boots are in place over both terminals of 1950 Buick battery to switch cable. CAUTION: Occasionally, certain chemical “dopes” are offered which their sellers claim will “recharge” the 1950 Buick battery when put into the 1950 Buick battery cells. Such chemical substances are harmful to the 1950 Buick battery and must never be used. Use of such material voids all 1950 Buick battery warranty. The only way to charge a 1950 Buick battery is to connect it to a charging circuit. There are two separate methods of recharging batteries which differ basically in the rate of charge. In the “slow-charge” method, the 1950 Buick battery is supplied a relatively small amount of current for a relatively long period of time. In the “quick-charge” method, the battery is supplied with a high current (as much as 100 amperes) for a short period of time. The “slow-charge” method, properly applied, may be safely used under all possible conditions of the 1950 Buick battery, provided electrolyte is at proper level in all cells. The battery may be fully charged by this method, unless the battery is not capable of taking a full charge. A 1950 Buick battery cannot be brought up to a fully charged condition by the “quick-charge” method. The 1950 Buick battery can be substantially recharged or “boosted” but in order to bring the battery to a fully charged condition, the charging cycle must be finished by charging at a low or normal rate. Some quick-chargers have a provision for finishing the charging cycle at a low rate so that the battery can be brought up to a fully charged condition. Used with care, and employing all safeguards provided by the manufacturer, a quick-charger will not damage a battery which is in good condition. 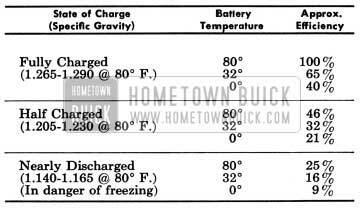 The “quick-charge” method must not be used, however, if the following conditions exist in the 1950 Buick battery. If gravity readings are not uniform, the low-reading cell may have an internal defect. Quick-charging may cause considerable heat to develop so that the battery would be ruined. If electrolyte is discolored with brownish sediment, quick-charging may produce an internal short and ruin the 1950 Buick battery. A sulphated 1950 Buick battery will overheat during quick-charging Such a battery requires charging at half the normal “slow-charge” rate for from 60 to 100 hours to reconvert the crystalline lead sulphate into active material again. A 1950 Buick battery which has been badly overcharged may quickly fail if placed on quick­charge. The 1950 Buick battery cell voltages and the color of electrolyte should be checked a few minutes after the 1950 Buick battery has been put on quick charge. If cell voltage readings are not uniform within 2/10 volt, or if electrolyte has become discolored with brownish sediment, quick-charging should be stopped immediately. Charging may be continued by the “slow-charge” method.